Meet the perfect tool for wilderness adventure! Next time your players are ready to explore the forest, they won't have to wait for you to draw every tree and bush of the expanse. 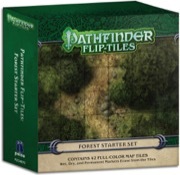 Pathfinder Flip-Tiles: Forest Starter Set provides beautifully illustrated 6" � 6" map tiles that can be used to construct a never-ending forest full of hazards and beasts. Inside, you'll find 42 richly crafted, double-sided map tiles and six tabbed dividers to keep them organized.